MANILA, June 29, 2016 – Global technology innovator LG Electronics brings to the Philippine market a breakthrough washing machine that redefines the concept of laundry. 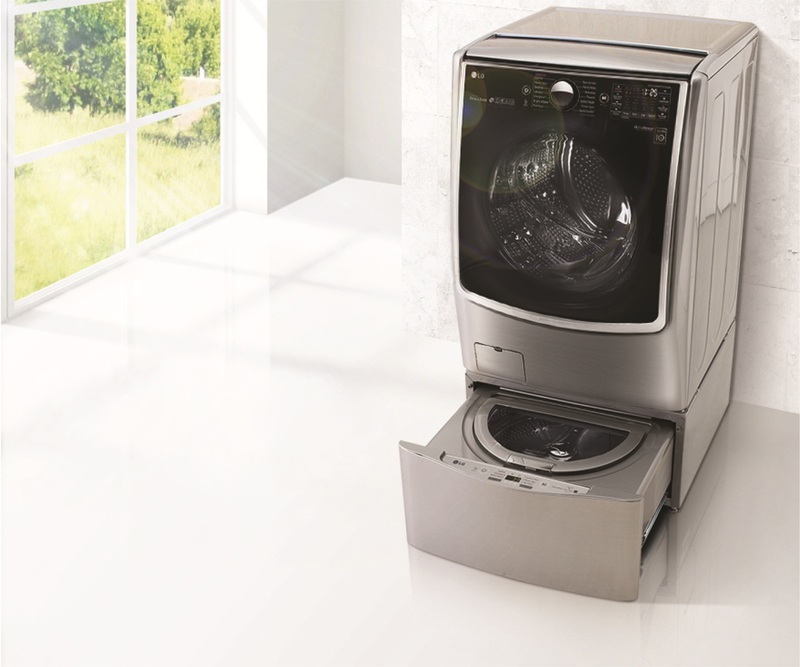 The world’s first LG TWIN Wash enables two separate loads to be washed simultaneously by combining a full-sized front loading washing machine with a mini-washer in a hide-away pedestal, generating a whole new set of washing options. The safety of one’s clothes is one of the most important factors to consider in purchasing a washing machine. LG TWIN Wash is designed to be able to give special treatment to different types of laundry with its two-in-one system. The powerful main washer handles the larger garments, while the mini-washer is perfect for specialized items that require a unique wash setting like lingerie or baby clothes. The mini-washer is big enough to hold a full load of delicates yet small enough to use just the right amount of water and electricity, which is normally an issue with bigger washers. This feature offers wash modes specifically for delicate items, guaranteed to clean these types of clothes as gently and thoroughly as hand washing. Due to the dual washing system, washing time is significantly cut down as multiple loads of laundry can now be handled simultaneously. Smaller loads can be washed when needed without having to wait until a full wash load has accumulated, saving users time and adding a new dimension of convenience. LG TWIN Wash™ is designed to fit in the space of a typical front loading washing machine so nothing is sacrificed for the added convenience. The door of the main washer is aligned with the drum’s center, positioned higher than on conventional models and tilted at an angle to make loading and unloading the main drum easier. The mini-washer and pedestal housing can be purchased separately to give current owners of LG front loading washing machines all the benefits of the TWIN Wash at a fraction of the cost. LG TWIN Wash™, available in modern stainless, received the Red Dot Design Award and the IDEA (International Design Excellence Award) in 2015. TWIN Wash™ also features LG’s unique TurboWash™ 2.0 technology. Nozzles positioned inside the drum of the main washer spray a concentrated solution of detergent directly onto the clothes, improving the unit’s cleaning performance. Another high pressure nozzle sprays tiny water particles through the clothes during high spin cycles for more effective rinsing. The revolutionary Inverter Direct Drive motor at the heart of the TWIN Wash™ is attached directly to the drum, improving efficiency and reducing the number of moving parts, leading to enhanced durability. To learn more about the pioneering LG TWIN Wash, visit lg.com/ph; like LG Philippines’ Facebook page; or follow @LGPhilippines on Twitter and Instagram.